Torch Test is used to detect antibodies against various infectious agents and their concentration in blood. antibodies are the protein molecules that body produces in response to infectious agent. These antibodies help to kill or eradicate the infectious agent out of the body. Torch test is sometime referred to as torch panel. Its name Torch Test is derived from the names of five infectious agents. Hepatitis B, Syphilis, Epstein bar virus, Coxsakei virus, Varricella zoster virus and human parvo virus. 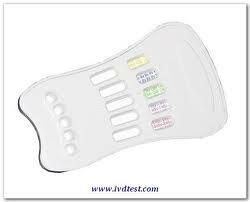 TORCH Test is a screening test. Its purpose is to find out whether the new born has got infection from either of above mention organisms or not. Usually blood sample is taken to measure the concentration of antibodies. But sometimes other specimens (e.g urine, CSF or tissue ) are taken to confirm the diagnosis of specific infection. CSF (cerebrospinal fluid) is tested to confirm the diagnosis of toxoplasmosis, rubella or syphilis in special cases. In case cytomegalovirus infection, diagnosis is confirmed by culturing organism in the sample of infant's urine. In case of Herpes simplex virus infection, Tissue culture is best method to confirm the diagnosis. Its method has become very simple. only a single drop of serum is placed on TORCH kit and results are noticed. TORCH Test is important because the infectious agent may cause TORCH SYNDROME in new borns.